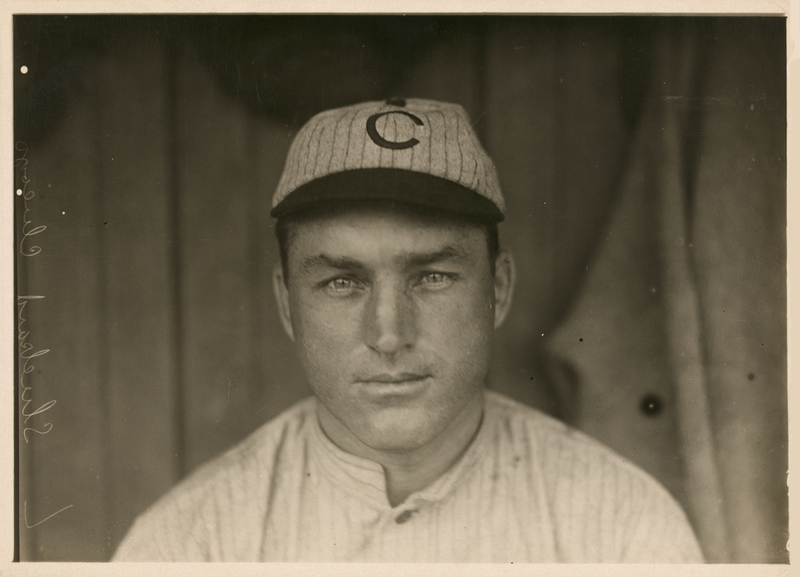 “He was a bigger cog in the old invincible Cub machine than he ever received credit for being”, stated Johnny Evers, in reference to the sometimes exceptional, more often inconsistent Jimmy Sheckard of the Chicago Cubs, he of the steely, blue-eyed stare in the photo above taken in 1911 by Paul Thompson. Sheckard would show flashes of power, good contact, speed, and defensive prowess throughout his career. Breaking in with the Brooklyn Bridegrooms in 1897, he hit .277 in 1898 before moving to the (NL) Baltimore Orioles in 1899; playing regularly for rookie manager John McGraw, Sheckard hit .295 and led the league in steals with 77. He also sparkled in the field, setting the NL record for double plays by an outfielder with 14, a record that still stands today. Moving back to Brooklyn (now the Superbas) in 1900, he broke out in 1901 with a big offensive season (by dead-ball standards) – a career high .354 average, 11 HRs, 104 RBIs, leading the league in triples with 19, and slugging percentage (.534). That year, the speedy Sheckard became the only player in MLB history to hit inside-the-park grand slams in two consecutive games. But the inconsistency that marked his career was evident in 1902, as he sunk to a .265 average and a mere 37 RBIs, in only 6 fewer games than the previous campaign (including an early 4-game detour to the now AL Baltimore Orioles). He would rebound in 1903 with a .332 BA and 9 HRs to pace the league, and his running game returned, topping the majors with 67 steals. But another down year in 1904 at .239 led to increased discontent with the Brooklyn brass, and despite another upturn in 1905, was dealt to the Chicago Cubs for 1906. Installed as the full-time left-fielder for the Cubs in 1906 by manager Frank Chance, he became a steady presence as Chicago steamrolled to the pennant with 116 wins, although his first career visit to the postseason resulted in an inauspicious 0-21 mark at the plate as the Cubs lost the World’s Series to the “hitless wonder” White Sox in 6 games. Sheckard would never reach the .300 heights again, but would have consistent numbers during his Chicago tenure, as the Cubs again won pennants, and World’s Series titles, in 1907 and 1908 (Sheckard would do better in these series, batting 5-21 in both), and another pennant in 1910. Sheckard would have probably his finest season in 1911 (the year of the photo above); a cleanup slugger in his Brooklyn days, he was now a feared leadoff hitter who looked to wreak havoc out of the gate, leading the NL in runs with 121, and setting an MLB record with 147 walks, which wasn’t broken until Ruth in 1920 (upon the death of the dead-ball era and the birth of walking sluggers with more regularity) and not in the NL until 1945. He would again lead the league in walks in 1912 with 122, but his career was winding down and would retire after the 1913 season. A power hitter that led the league in HRs, then a speedster that led the league in steals and/or walks, and other years barely getting past .230, Jimmy Sheckard had an up-and-down career, but was ultimately a key part of that “Cub machine” of the ’00’s that would have been hard pressed to have as much success without him.